When I gave my copy of The Modern Baker to my hubby so he could choose my "official" blogging cookie for the cookie section of the Challenge, he immediately picked cocoa nib brownies. I didn't commit, though, because I had no idea where to get cocoa nibs. The brownies are made with a similar method to the truffle brownies and Florida brownies from Bake!, both of which are now family favorites. The butter is melted until it sizzles, and then the chocolate is added and allowed to melt. Meanwhile, the brown sugar is mixed with the eggs, and then salt, sugar, and vanilla are added. The chocolate-butter mixture is stirred in with a spatula, and then the flour is folded in. Finally half of the cocoa nibs are added to the batter and the rest of them are sprinkled over the top. As with the other brownie recipes, NM says to refrigerate them overnight before cutting them. He also warns that it may be hard to pull the foil off the brownies because they're so moist; he's not wrong about that! Of course, when little pieces broke off, we just had to sample them, even though they hadn't been cooled overnight. These are so good! NM says, "Nibs are unsweetened, so they have to be used somewhat sparingly to avoid imparting a bitter...flavor. They're the perfect counterpoint to this fudgy brownie recipe, adding a little texture and a bit of balance to the batter's natural sweetness." I couldn't agree more! Because they're so rich, I cut them into little 1" squares. I brought some to school to share with some of my debaters who helped to give a grant presentation the other day. Hubby brought some in to share with his coworkers; when he turned around, the container was empty. I had a little container leftover, saved for my photos, and asked hubby for permission to bring them to share with my coworkers....you should've seen the look I got! He was not going to give any more away! :) By the way, these are great alone, but even more excellent with a little scoop of vanilla bean ice cream. My final November Mellow Bakers bread is a five-grain sourdough made with a rye sourdough. At the same time that the sourdough is prepared, a soaker is also prepared: flaxseeds, rye flakes, sunflower seeds, oats, and salt are all soaked in water. After an overnight rest, the sourdough and soaker are combined with high-gluten flour (I used bread flour and vital wheat gluten), instant yeast, honey, and water. My dough was quite wet and I was a little nervous, but after an hour's rise (with no folds), the dough was actually easy to shape. I made a 2 pound loaf for my oval banneton and then two 2-ounce dinner rolls (I'd made a half-recipe). The kids didn't like the bread, which was no surprise; they don't like seeds in breads. I really love multigrains, but found the rye flavor a little too strong; it was okay, but not a favorite. Hubby really enjoyed the bread with soup, as eggs in a nest, and with Thanksgiving leftovers. And to everyone out there, I hope your day was filled with lots of love and good food. Oh, you have no idea how excited I am to start this section! Cookies are technically supposed to be our last section of the Modern Baker Challenge, but knowing how many cookies people generally bake at this time of year, our brilliant leaders/members decided to flip-flop the final two sections. Looking at the list of possibilities, I positively could not commit to which recipes to pick; they all sound and look so good! I made these to bring to my debate class to thank them for their hard work hosting a middle school debate tournament last week. I was surprised by the technique. You start by mixing softened butter, brown sugar, vanilla, and eggs in a stand mixer, just until blended. Usually you cream these ingredients for quite a while, but NM warns against over-mixing, so I really just mixed them until they all came together. Then you gently fold in the flour mixture (flour, salt, and baking soda) with a rubber spatula. I was worried that it wouldn't all come together; it just seemed impossible to get all of the flour incorporated. But with patience, it worked and I had smooth cookie dough with no extra flour. Then I folded in a lot of chocolate. NM calls for 6 ounces of chopped bittersweet chocolate and 6 ounces of chopped milk chocolate. I had a 4 ounce bar of bittersweet, so I used that. And then about 6 ounces of semi-sweet chocolate chunks. Even missing 2 ounces of chocolate, I felt like this batter was more chocolate than cookie. The cookies are placed in teaspoon-sized rounds on the cookie sheets. NM says to cook two trays for 15 minutes, rotating the trays halfway. By 12 minutes, both of my trays were burned. I'm not sure if they were really supposed to be tablespoon-sized? Or if 15 minutes is just way too long? NM's baking times are usually pretty accurate for my oven. I experimented and ended up finding that 10 minutes, baking one tray at a time, seemed about perfect. I was able to get about two trays of good cookies. (I figured high schoolers would eat the burned ones anyway!) So be sure to watch these carefully!! Gr. I purposefully left a mini tart so I could take a photo this afternoon. And then forgot about it until it was dark again. This only being home for one hour of daylight is killer on the food photography. This weekend's Bake! pick was Margaret's; she picked chocolate meringue tart (or chocolate marshmellow pie, as my kids called it). This one should've been easy, except that my little guy who is usually asleep by 7:00 was up until 9:30 last night, which meant this was definitely a case of distracted baking. Meanwhile, I made the chocolate cream (a half-batch, which filled the three mini tart crusts and a large-ish ramekin): whole milk, sugar, half-and-half, corn starch, eggs, and bittersweet chocolate. Margaret had a problem with her cream not setting up...mine went the other way. It was really close for a long time...and then something happened with the little guy and when I looked back, it was so thick I could barely stir it. I was worried that it would taste curdled or lumpy, but the texture was actually perfect. I baked the mini tart crusts until they were golden. Unfortunately, I forgot to weigh them down with beans, so they shrunk up quite a bit in the oven. While the crusts and chocolate cream were cooling, I made the meringue. This part did not go so well. I'm not sure what happened, as I've used NM's method of heating the egg whites, sugar, and salt, and then whipping them before with great success. But mine never thickened up (check out Margaret's for a look at how beautiful and full-bodied it should've been), and again I was dealing with the little-guy-who-wouldn't-sleep, so I just gave up and dumped it on top of the chocolate. I think because of the lack of fluffiness, my meringue took a lot longer to turn golden in the oven. It didn't matter. Hubby gobbled his mini tart right up. He said that he's normally not crazy about meringue, but he loved the crust and the chocolate, and the meringue had a more marshmellowy texture that was actually quite yummy. So despite everything, a success! I made a third of this recipe, which was enough for one medium loaf. The bread was made with a stiff biga (bread flour, whole wheat flour, water, and instant yeast), more bread flour, more whole wheat flour, salt, water, instant yeast, and golden raisins and walnuts. This challenge has definitely changed my family's opinion on breads with fruit and nuts in them. While we used to dislike every one, we've really enjoyed the last couple, and this one was no exception. The walnuts gave a great crunch and the flavor of the bread was really enhanced by the sweetness from the golden raisins. A tasty accompaniment to dinner! Our November chef for our Twitter avatar fun was Ghillie Başan, chosen by Andrea. She is new to me; according to her website, "Ghillie Başan is known for her informative and evocative books on the culinary cultures of Turkey, the Middle East, North Africa and Southeast Asia." Sounded good to me! There aren't many of her recipes on the web, but I did find several that sounded intriguing on her site, including the recipe for tagine of yams, carrots, prunes, and honey, a recipe from her book Modern Moroccan. The recipe calls for yams, but with how many squash we still have in our basement, I did a little checking to see if there were any squash that could be substituted for yams or sweet potatoes. And I found one: delicata, which is even called "sweet potato squash." The recipe called for pearl onions, but I had a leek and some yellow onions in the veggie drawer, so I used them. The final substitution that I made was the stock; this is vegetarian dish which calls for vegetable stock, but I was all out, so I just used low-sodium chicken stock. And the result? We really enjoyed this side-dish! The veggies are slightly caramelized and quite sweet. It was delicious with a roasted chicken, my most recent Mellow Bakers bread, and fruit. 2. In a large dutch oven, heat the olive oil and butter. Add the onions and cook over medium heat until tender, about 3 - 4 minutes. Remove half of the onions and set aside. 3. Add the delicata and carrots to the pan, increase the heat to medium-high and cook until lightly browned, about 6 - 8 minutes. 4. Add the prunes, spices, and honey. Stir. Then pour in the stock, salt, and pepper. Stir and cover. 5. Put into the oven and cook for 45 minutes. Add the rest of the onions and cook an additional 10 minutes. 6. Sprinkle with cilantro and serve. My first November Mellow Bakers bread is an olive fougasse. I made half a recipe, which made one loaf, and I could've easily made the whole thing as the entire loaf was demolished in no time. This bread got squished into life; it's the first time I've ever taken a bread-in-progress with me to work. :) I made the paté fermentée at dinner time and mixed the dough together the next morning before work. (Luckily it was fast to knead the bread flour, whole wheat flour, water, salt, instant yeast, olive oil, paté fermentée, and olives, as hubby was shooting me dirty looks because I was making us late!!) Carrying my little measuring cup of dough, I brought it to daycare drop-off and then to work. 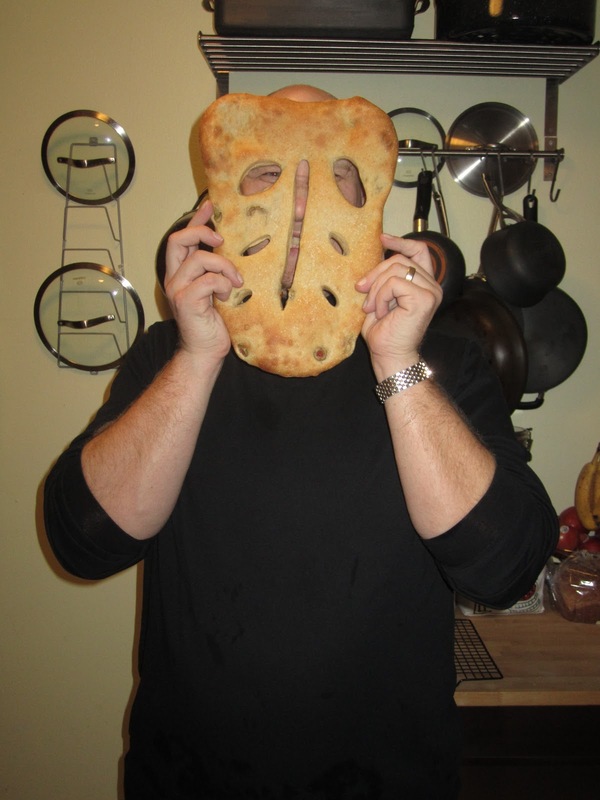 Right before the students arrived, I scrubbed my hands, did a quick stretch-and-fold, and threw my dough into the fridge. At the end of the day, I pulled the dough and let it come to room temperature during our faculty meeting. I preshaped the dough into a round while I was picking up the kiddos from daycare, and then we headed home. There I rolled out the dough, let it rise while I made the night's soup, and then baked it up. It was finished in 20 minutes and ready to eat five minutes after that. As I said, a big hit with the fam, and while scheduling was interesting, it wasn't too challenging to make for a quick bread and soup dinner. I love Thanksgiving dinner. No, I mean I really love it. It has always been my favorite meal of the year, and I've actually always insisted on the exact same meal for Christmas, just so I can eat it again (although I am trying to branch out a little more to honor my hubby's preferences). I love turkey, mashed potatoes, stuffing, pumpkin pie, apple pie, green bean casserole...and I really love leftovers. So when Phyl, host of our pumpkin dinner a few weeks ago, offered (with maybe a little pressure?) ;) to host a virtual Thanksgiving dinner, I was so excited! So excited, in fact, that when he asked us to pick a menu item, I just couldn't decide; I love them all! I went back and forth (our famous mashed potatoes? my dad's awesome sausage wild rice stuffing? my mother-in-law's pumpkin pie? my mom's yummy turkey?) until finally all of the categories had been taken by others and I was left with........soup. Which we've never served at Thanksgiving dinner. Hm. Luckily, Phyl recently sent several of us a great new Thanksgiving cookbook, so I started paging through...and came across butternut squash bisque. Now, I've mentioned our abundance of squash on more than one occasion; clearly, this soup was meant to be. The recipe states that the soup can be made up to three days ahead of time, so I made the soup on Monday night and served it on Wednesday. It was easy to make, delicately-flavored, and delicious! It's one of those soups that feels creamy and indulgent, but actually only has a small amount of cream, with much of the texture imparted from the squash itself. I thought the garnish of fried sage leaves and popcorn seemed a little fussy, but they actually only took a few minutes to pull together and they really added something special to the final product; I'd definitely include them again. 3. Purée the squash and apple (without the skins) in a food processor until smooth. Add 1 cup stock and process until smooth. 4. In a large (4-quart) saucepan, whisk the squash/apple mixture, the rest of the chicken stock, the cream, the nutmeg, and the sugar. Bring to a boil and then simmer for 10 minutes. Season with salt and pepper. 5. Make the garnish: heat the oil in an 8" sauté pan until it reaches 365º. Fry half the sage leaves for 5 seconds, remove with a slotted spoon, and place on a paper-towel-lined plate. Then fry the second half. 6. To serve: ladle the soup into bowls or mugs and garnish with the sage leaves and popcorn. Be sure to check Phyl's site later this week for the rest of this yummy Thanksgiving meal!